Speaking in Auckland today, Bolt, who won double sprint gold in Beijing and London, swept aside speculation that he could challenge for the 400 metres or long jump in Brazil. USAIN BOLT HAS confirmed he will defend his sprint titles at the Rio de Janiero Olympic Games in 2016. “Rio is about going and defending my titles. I don’t want to try any different events at Rio because at Rio I will just defend my titles to show the world that there is a possibility that I can do it again — to do the three-peat, that is the focus,” he said. Bolt said there was no better feeling than doing the preparation and lining up at the start line knowing no-one could beat you. “It’s all about hard work. When I was doing great when I was young people used to say I was fast for my age but I have put a lot of work into since I was a senior athlete and I continue to work hard, continue staying focused and pushing myself so for me that’s the focus right now to see how fast I can go and I definitely try to go faster each year,” he said. 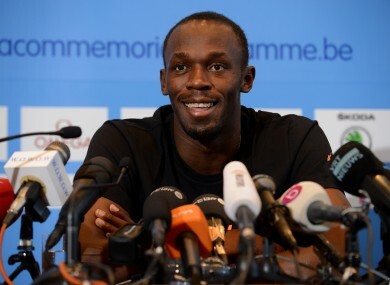 Bolt said that while he had been described as ‘cocky’ with some of his antics it helped him focus. “The gimmicks that I do are just to make me relax when I get to the line. It makes me relax and not worry about the competition because when you start worrying you get tense and you may just false start. For me I just do that to relax my mind and take my mind off the race,” he said. Bolt said it was necessary to have mental strength when dealing with the expectations of his Jamaican public. “If you’re not mentally strong it breaks you down easy. For me the key thing is to want it for yourself first,” he said. ”It’s easy for me because I want it for myself first and then the country comes after. If you want to do good for yourself you are going to push yourself to do the best that you can do. Email “Bolt confirms Rio 'three-peat' bid ”. Feedback on “Bolt confirms Rio 'three-peat' bid ”.